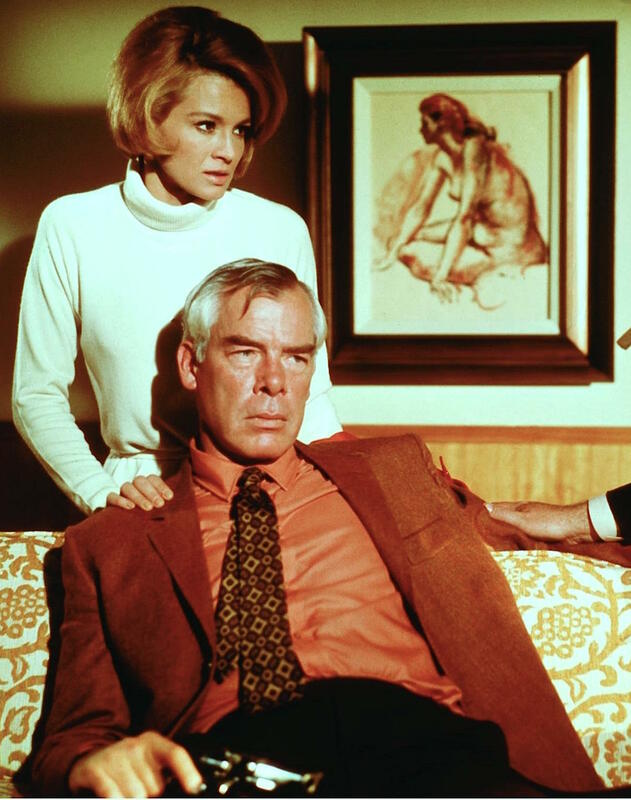 Angie Dickinson and Lee Marvin in Point Blank (1967). Responding to another request from BAMF Style commenter Ryan Hall, this post looks at Lee Marvin’s wardrobe in 1967’s Point Blank, the first cinematic adaptation of Donald E. Westlake’s crime novel The Hunter. The book became the first in the long-running Parker series penned by Westlake (as “Richard Stark”) that led to a total of 23 books before Westlake’s death in 2008. At this point in the film, Walker (the film’s re-named version of Parker) is edging closer to getting his $93,000 back. Together with his sister-in-law Chris (Angie Dickinson), Walker heads to the home of syndicate boss Brewster (a pre-All in the Family Carroll O’Connor) to move the endgame into place. Although Point Blank is set in summertime, San Francisco’s year-round chilly weather means Walker’s warm, creative earth tones makes a great fall outfit. Walker’s rust brown flannel sport jacket is single-breasted with distinctive notch lapels that roll down over the top of the three-button front. The left lapel has a buttonhole and a sporty throat-latch tab edging out into the notch. The shoulders are padded with roped sleeveheads. Walker’s jacket has some sporty details like the throat latch lapel tab and the flapped breast pocket. All three external pockets – the breast pocket and the straight hip pockets – are set-in and covered with flaps. The jacket has a relatively short fit, both to stay in step with 1967 fashions and also because Lee Marvin is a tall man at 6’1″. Like Walker’s other sportcoats (but not his suit jackets), this jacket has double vents and 1-button cuffs. Walker’s salmon orange poplin shirt appears to be a polyester/cotton blend with a soft, microfiber finish. It has a narrow spread collar, button cuffs, and a wide front placket with mother-of-pearl buttons. His patterned tie is three shades of brown that provide a cooler contrast against the warmer brown flannel jacket and clash with the bright orange shirt; a dark brown abstract grid on the tie connects a series of tan and brown dots and figures. A jaded Walker reflects on the events that led him to Brewster’s apartment. Like his other trousers in Point Blank, Walker’s dark brown flat front trousers in this scene are worn beltless with a fitted band that rises high on his waist. They taper down the leg to the plain-hemmed bottoms. Walker wears the same brown cordovan leather 4-eyelet longwing brogues by Bally throughout Point Blank, and they are especially fitting with the earth tone outfit in this scene. Due to their construction with wings extending the full length of the shoe, longwing brogues are almost always derbies. These brogues, with their medallion-decorated toecaps, were made by Bally as proven by the British Film Institute site. He likely wears them with dark brown socks here. A man of few words, Walker isn’t afraid to let loud clothing do his talking for him. Point Blank will be screening on 35mm tomorrow night at 7pm at San Francisco’s ‘ROXIE THEATER’. This would be a hell of a movie to see on the big screen! I hope you get to check it out tonight, Chris. 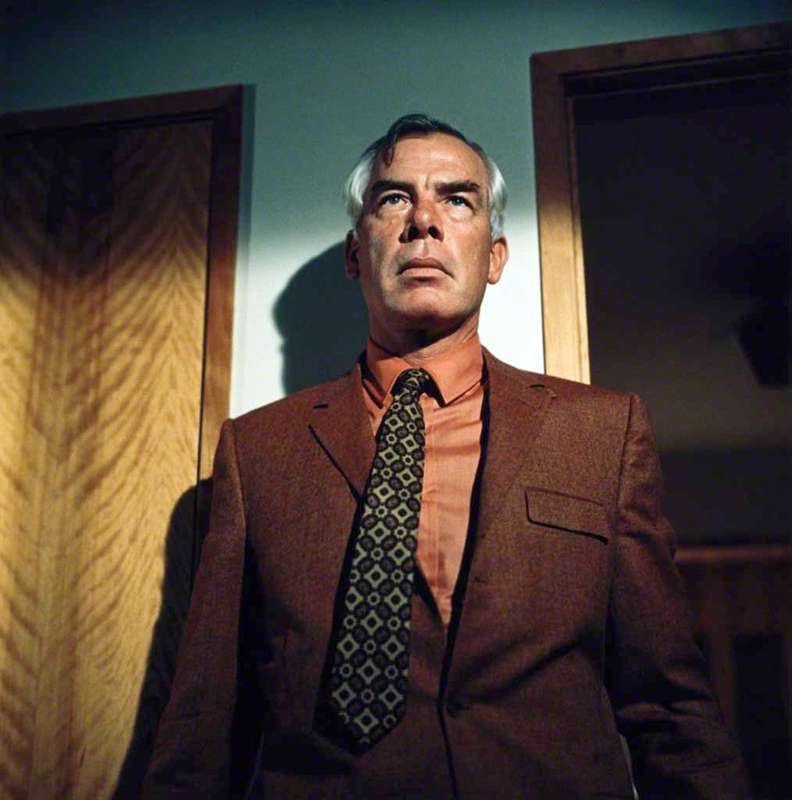 To see Lee Marvin in full BAMF mode, check out “Prime Cut”. I’d love to see you profile that film. Thanks for the tip, I’ll have to check it out! That’s a great film, the final gun battle is one of the best ever. Marvin pulls out a sub machine gun from his briefcase and tapes two magazines together jungle style. A great outfit from Marvin, showing you that you don’t have to be Paul Newman or Robert Redford in the looks department to dress coolly and look a million dollars. It’s an outfit that could work well today with a few minor alterations. I think the orange shirt screams 1967, so with a different shirt (even though I like the shirt) and maybe a less bold tie you could wear that outfit to an outdoor social event in 2016 and look relaxed and cool. I agree, Ryan! It seems like the film’s marketing team was even aware of the outfit’s “loudness” even in 1967 as some promotional artwork for the film features the same jacket but tones it down with a white shirt and coloring the tie in all red tones. I hope you recall that this was one of your initial suggestions as well! It was on point and very fashionable for 1967. They make Marvin look more like a Don Draper conservative. Speaking of Don, missing Mad Men since it finished, watched all the episodes with my wife recently. Would love to see another post about Don. He wore some great suits and sports jackets in the later seasons.